With easy push button activation with 60 second auto shut off, the Chad Valley Floating Ball Fun Zone is a great way to make play time majestic as little ones let enthusiasm burst out! 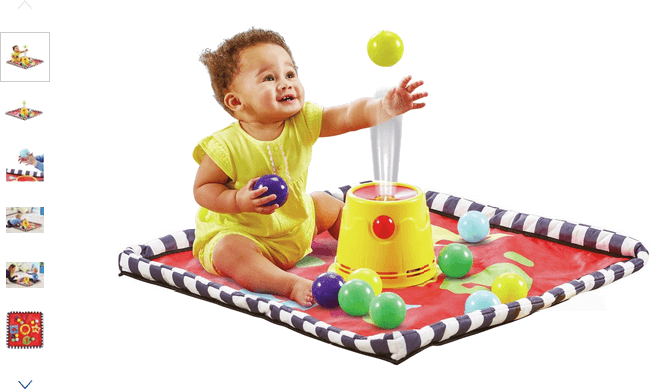 Packed with incredible features such as powered ball blower, vibrantly coloured play mat and of course play balls (10), the creative technology and easy functionality of this toy will see you little ones transfixed watching the balls float in the air as if by magic. This toy is perfect for developing dexterity as little ones coordinate the synchronization of their tiny hands and fingers with their eager watchful eyes. Get money off with April 2019 free Argos voucher codes, see if there's a discount code for the Chad Valley Floating Ball Fun Zone product.